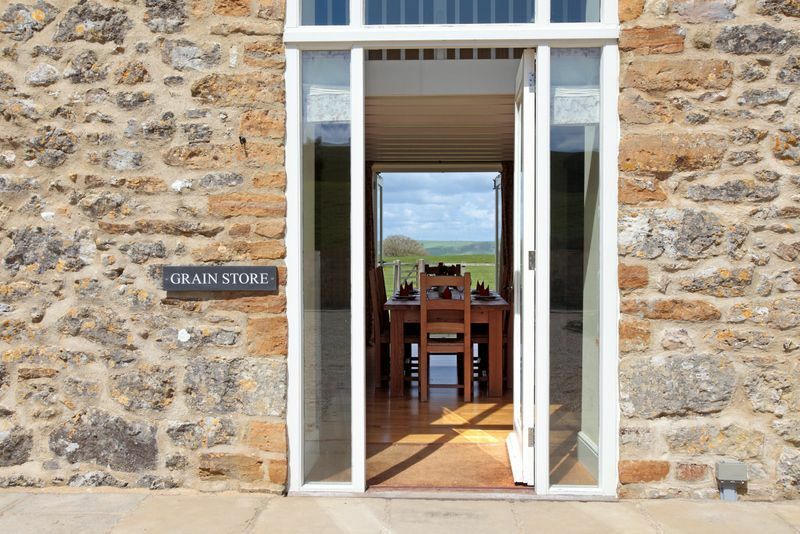 The Grain Store is one of three barns located at Wears Farm just outside the pretty village of Abbotsbury. Easy access to Dorset Ridgeway and SWCP. Spacious and light open plan layout (kitchen, dining & living areas) with wooden floors and big feature windows. Sleeps 6 in 3 bedrooms (2 king & 1 twin). 1 ensuite bathroom (shower cubicle), 1 family bathroom (shower over bath) and 1 cloak room (downstairs). The property has been awarded a five star Gold Award by Visit England. Once again a very comfortable stay in a very well appointed cottage. The peace and quiet was wonderful and the views remain amazing. We had a couple of issues with the property, central heating not working and door strip stopped the front door from closing, both were speedily dealt with and the staff who attended the property were very professional and sorted the problems very quickly. Thank you for your kind review, we are glad that you enjoyed your stay at The Grain Store and we very much hope to welcome you back. We very much enjoyed our time in The Grain Store over New Year. There are wonderful countryside views from every window and the accommodation is spacious with every comfort. We particularly loved the Christmas Tree—such a thoughtful touch and very much appreciated. Thanks to all at Luxury Dorset Cottages. An amazing house in a stunning location. The barn is spacious, lovely comfy sofas, warm and bed was super comfortable. Powerful showers and really clean. We have already booked to go again. Could not ask for anything better! Home from home. Thank you so much for your kind review. We are delighted that you enjoyed your stay and we look forward to welcoming you back next year. Thank you again for your kind reviews of the properties. We hope to welcome you all back to one or more of our properties again. We were 5 adults, and we loved the property - sympathetically converted, spacious, well equipped and with such easy access to the coast path. Our queries were dealt with efficiently and we were blessed with good weather. What more can one ask? Lovely barn in a great setting. Very comfortable inside. Two points I would make - the shower in the double bedroom is very small even if you are a petite person and a few more pieces of crockery would be very useful. Just enough cups, plates etc fr six people is too short. Apart from this a lovely place to stay and we will certainly return at some time. Thank you very much for your review, we are very glad to hear that you got to enjoy the beautiful setting of The Grain Store. Thank you for your comments which I have passed across to my manager. We hope to welcome you to Wears Farm again. Garden furniture, umbrella and charcoal barbeque provided during summer months. Charcoal is not provided. Bed linens and towels changed on middle Friday of 2 week stays. Heating included (gas fired central heating).